This premium Communion invitation is sure to impress your family and friends. 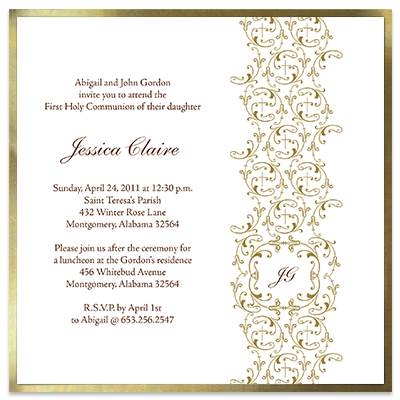 An intricate pattern of gold crosses frames your child's initials, with event information printed to the left. This square card is attached to a metallic gold backing for a stunning, layered look and added sparkle. Card measures 5.875 in. square and comes fully assembled with matching envelopes. Additional postage required.